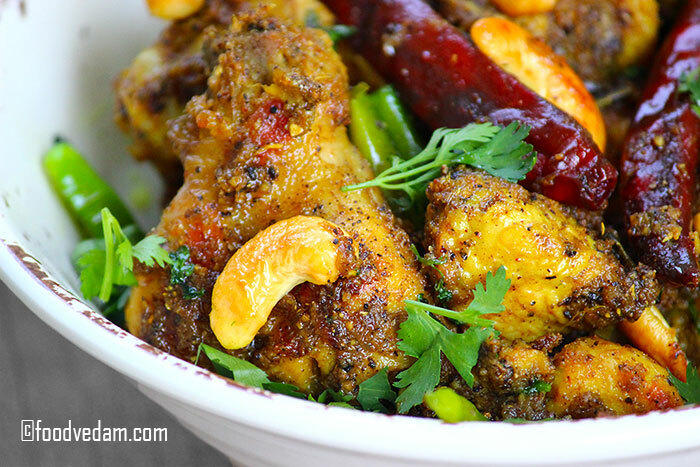 Pepper Chicken Recipe with step by step instructions. 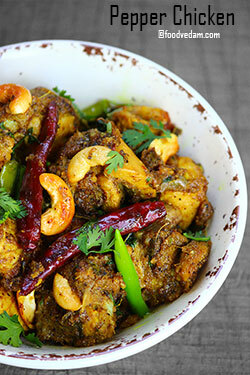 when you get bored of eating regular chicken curries, you can try this pepper chicken recipe.though both red chilies and pepper are spicy, they differ in their taste and pungency.In my opinion, more than India the other countries use pepper powder in seasoning the meat.because whenever I watch TLC and other food-related channels I see most of the chefs adding nothing but the pepper and salt to the meat.this magical ingredient changed the 400 years of history of India.pepper is a natural meat tenderizer.it removes the fishy smell of the meat and gives a subtle taste. for this recipe, I have marinated the chicken with salt, 1 tbsp pepper powder, ginger garlic paste, yogurt, turmeric powder, and soaked it for 30 minutes.by doing this the chicken pieces will absorb the flavors and also become tender.if you are preparing this recipe with thigh pieces or leg pieces then you can skip the marination.but when you are using chicken breast pieces you should definitely marinate them.otherwise, the pieces will become hard and rubbery after cooking. I have used 1 tbsp of Pepper powder in the marination and 3 teaspoons in the curry.It tastes a bit spicy.we would enjoy the taste but the children may not be able to tolerate the spiciness.so please adjust the spiciness(pepper powder) according to their tolerance level.you can squeeze out half a lemon just before you turn off the heat.it enhances the taste.this curry when served with hot rice and charu/rasam tastes really good.it can also be served with Chapatis or Naans.I hope you try and enjoy this recipe :). ఈ recipe తెలుగు వెర్షన్ కొరకు ఇక్కడ click చేయండి. take the chicken in a mixing bowl, add turmeric powder, salt, pepper powder, ginger garlic paste, yogurt, curry leaves and mix well. heat a pan, add coriander seeds, cloves, cardamom, cinnamon, star anise petal, fennel seeds and roast for a minute.then add poppy seeds, desiccated coconut powder, and roast for 15 seconds. put them in a grinder and make into a fine powder. heat oil in a pan.add onion paste and saute for 2-3 minutes. add the chicken marinade, mix well and cover it with a lid and cook for 15-20 minutes on medium flame. remove the lid and mix for once. add chicken masala, pepper powder, mix well and cook for 5-7 minutes. add slit green chilies, curry leaves. then, add roasted cashew nuts and chopped coriander leaves and turn off the flame.